Established in 1966 as Ireland's first Comprehensive School, St. Patrick's is renowned locally, nationally and internationally as a centre of excellence for learning and educational development. St. Patrick's is an integral part of Shannon and makes its state of the art facilities available to the local community. 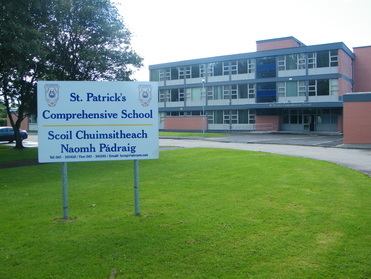 St. Patrick's Comprehensive School is a Catholic co-educational school under the joint trusteeship of the Bishop of Killaloe and Limerick and Clare Education and Training Board. St. Patrick's Comprehensive serves not only the Catholic community, but also in a rapidly changing and pluralist society, is committed to the ecumenical developments of our time and in the inclusive spirit of openness and multi-denominational service endeavours to serve many in the entire local community/. The school seeks to provide a Christian environment in which students find encouragement to develop spiritual and moral values, personal and social skills and the highest standards of excellence of which they are capable in all aspects of their school activities. We recognise the complimentary roles of parents and teachers in educating the young and, in partnership, we pursue the common aim of educating our students according to Christian principles. ​St. Patrick’s Comprehensive School is committed to excellence. We provide equality of opportunity for all students in a disciplined and caring environment. We encourage individual students to achieve their full potential and to relate positively to one another and to the community in which they live. Classes begin each morning at 9 am. Classes finish at 4 pm on Monday and Tuesday ​and at 3.20 pm on Wednesday, Thursday and Friday. Please note that students may not leave the school at the 11 o clock break but may do so at lunchtime with written parental permission.